Washington, D.C. – Today, the Small Business & Entrepreneurship Council (SBE Council) published a new book, which draws attention to the critical role that intellectual property plays in driving entrepreneurship, innovation and economic growth. The book, “Unleashing Small Business Through IP: Protecting Intellectual Property, Driving Entrepreneurship,” which can be accessed through SBE Council’s website or purchased through Amazon.com as a paperback or Kindle eBook, will help policymakers and the public understand why protecting intellectual property is essential to human progress and global prosperity. “Unleashing Small Business Through IP” explains the economic, industry, day-to-day business, and policy benefits of protecting intellectual property, as well as the ills of allowing IP theft to flourish. In highly readable fashion, “Unleashing Small Business Through IP” looks at the role of intellectual property in our economy and the global marketplace, among small businesses, in key industries (such as software, music, Hollywood, video gaming, pharmaceuticals, book publishing, and more), in history, in economic thinking, and in the policy arena. 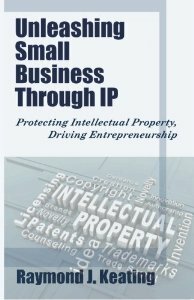 The paperback version of “Unleashing Small Business Through IP: Protecting Intellectual Property, Driving Entrepreneurship” can be purchased from Amazon.com. The Kindle eBook version of “Unleashing Small Business Through IP: Protecting Intellectual Property, Driving Entrepreneurship” can be purchased here. A PDF copy of “Unleashing Small Business Through IP: Protecting Intellectual Property, Driving Entrepreneurship.” can be read on SBE Council’s website here. SBE Council is a nonpartisan, nonprofit advocacy, research and education organization dedicated to protecting small business and promoting entrepreneurship. For more information please visit www.sbecouncil.org.